More than once I have already written how important healthy full breakfast for everyone. Nutritious, containing the necessary dose of "correct" carbohydrates, proteins and fats, which give a charge of vivacity, energy and, of course, a good mood for the whole day. Yes, often breakfast should be even and fast (we are all somewhere in a hurry in the morning), but this does not mean that he does not have to be beautiful and very tasty :) One of my absolute favorite - waffles! Of course, useful: chick-pea flour and oatmeal. Я обожаю эти полезные вафли еще и за то, что рецепт, как трансформер, можно бесконечно изменять, добавляя новые ингредиенты, экспериментируя с другими видами муки. А готовые вафли каждый раз дополнять чем-то новым: мягким творогом или Chizom-cream, Favorite cheese, poached egg, cheese terrine, Chicken liver pate. You can top it with fresh herbs, slices of red fish - the best alternative to a sandwich, I'll tell you! Waffles from chick-pea flour and oatmeal are rather crispy (you just need to hold them longer in the waffle iron). Oatmeal I like to use it flakes (not a ready meal) as well as the structure of wafers out denser and brighter flavor. The combination of chick-pea flour with oatmeal - one of the favorite, the taste is very balanced (this is what I have already written in the recipe Nutovo-oat pancakes stuffed with cheese and spinach:). 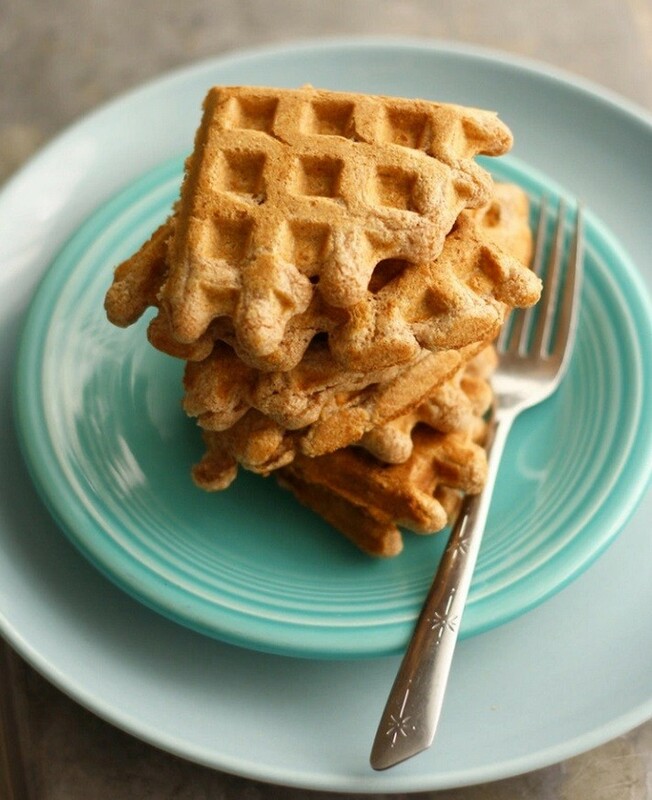 Yes, I must say at once that the sugar or honey in this recipe waffles advise you not to add chickpeas flour, in my opinion, is better suited for savory baking. Oat flakes pour warm water (minutes 5-10), wait until it is completely absorbed. Excess moisture is not needed, it will make waffles "liquid" and soft. Egg whisk. Add chickpeas flour, bran, salt, baking powder. Mix thoroughly whisk. Add swollen flakes, stir. Leave the dough to stand 15-20 minutes (can be a night). Bake in a well preheated waffle elektrovafelnitse (2-3 minutes), according to the instructions. To wafer cools down and remained crispy, it is better to cool on a wire rack. Tasty and healthy breakfast you! More ideas for breakfast you will find in this section.